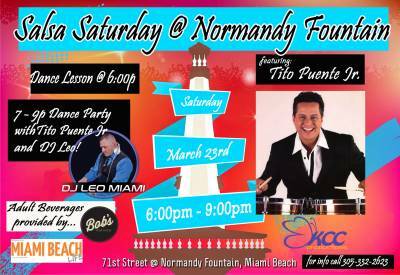 Join us on Saturday, March 23rd at the Normandy Fountain for our first ever SALSA SATURDAY featuring the legendary Tito Puente Jr and DJ Leo! At 6pm we will have a Salsa Dance lesson with Maritza Espin from Party Zone 305 to get everyone warmed up; at 7 Tito Puente Jr. will take the stage for a sensational Salsa Dance Party! Adult beverages provided by new neighborhood bar, Bob's Your Uncle with food by Bodegon. The fiesta lasts until 9! Bring your dancing shoes! Another amazing event at the Fountain produced by KCC Productions with local support from the Miami Beach Painting with a Twist, Urban Resource, and Rouge Restaurant! For more information call 786-606-4100 Video: https://www.youtube.com/watch?v=iUhZZR4mEp8 Eventbrite: https://www.eventbrite.com/e/salsa-saturdy-at-normandy-fountain-free-tickets-58942140529 http://www.eventsnearhere.com/find-events/FL/MIAMI-BEACH/Music/Live-Music/addetail/131175/Salsa-Saturdy-at-Normandy-Fountain---FREE! Check out Dates for: Salsa Saturdy at Normandy Fountain - FREE!